August seems to be quickly approaching, which is kind of a good thing b/c planning a small out-of-state shindig has proved harder than we originally thought it would be. Wes & I decided on sending out simple 6in x 6in postcards that had a bit of folk art feel to them. I sketched up an image that included both our home states and the tiny church we’ll be married in. I then painted the color separately and layered them together to give a slightly silk-screened effect. We then built our own site (more on that later) and will be letterpressing our own invites with our brand-new (but old) letterpress. So cute! Congrats! Can’t wait for pictures! 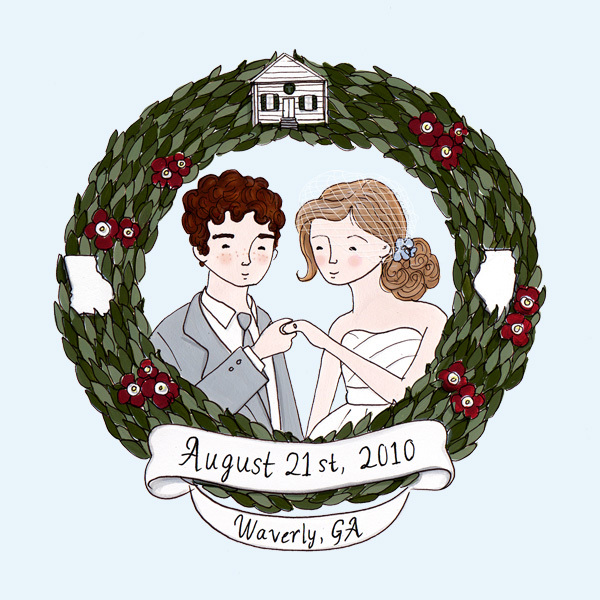 This is the cutest Save-The-Date I’ve ever seen! Can’t wait to see the site! love the website for it, i hope the roadtrip (super rad btw) comes through!!! 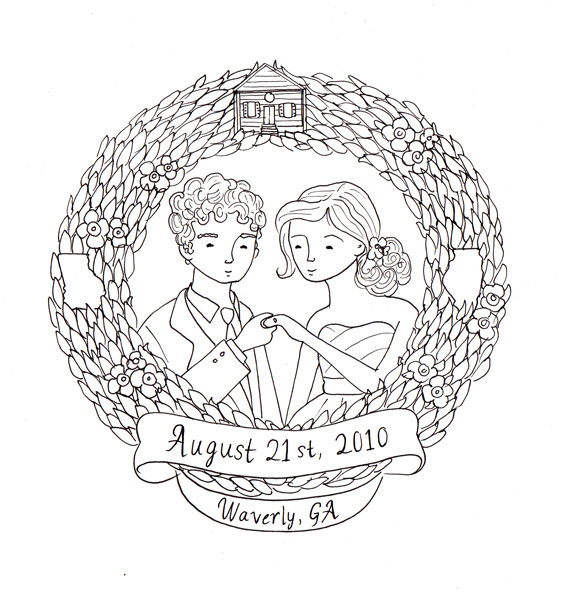 I love your sketch save the dates! My fiancé and I had a similar idea for our but my artist friend bailed at the last minute. Is there anyway chance I could pay you to create a sketch for our save the dates? We are wanting a simple drawing like the black and white one posted above that includes sketches of us in that similar style, both wearing dresses ( we are two women), with mountains or trees in the background and a banner saying save the date or whatever. We will pay you for one sketch and then make copies onto kind of rugged brown paper. Your signature will be included on all of them of course. Please contact me via email at ashleyhaight3@gmail.com if you are interested and willing to help us out!